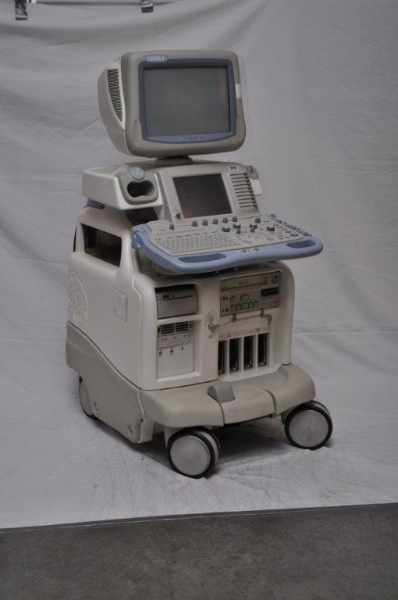 The GE Logiq 9 cart-based ultrasound is a quality, easy-to-use system design for the specific needs found in OB/GYN offices as well as radiology clinics, as well as for use when clear images are needed for vascular or abdomen purposes. Some of the more advanced technologies with this ultrasound include its coded harmonics, anatomical M-mode, and spectral wave doppler. When viewing images, the Logiq 9 also includes a 17-inch high-resolution monitor and a 10.4-inch color LCD touchscreen, which allows physicians to easily choose the right service package, preset, or other settings. The four active probe ports can accommodate matrix array transducers that allow physicians to achieve a uniform resolution throughout the field of view. The Logiq 9 ultrasound uses an integrated hard drive and a CD-R drive for quickly storing and transferring patient data.